Eli 14.7 went to a state-level USA Hockey Development Camp tryout last weekend. I know--didn't his team just win state about five minutes ago? Yes, but I don't schedule this stuff. So after one weekend at home, we went back to Dallas. This was a long tryout, potentially. Friday-Sunday, but only if he made the first cut on Friday. 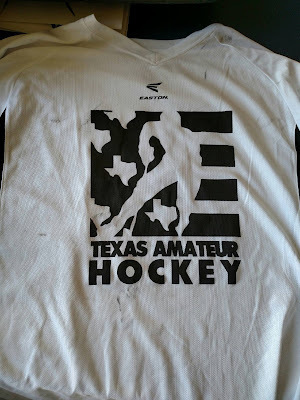 Basically, all the best kids in Texas/Oklahoma attended this state tryout camp in hopes of being selected to move on to the Rocky Mountain Region development camp in Salt Lake City for four days in May. That camp will have kids from seven states--Texas, Oklahoma, Colorado, Arizona, Utah, Idaho, and New Mexico. I'm not entirely sure, but I believe if you get selected from the Rocky Mountain camp, that leads to a national camp. 90% of the kids trying out were either AAA or AA players, so Eli was facing very stiff competition. Still, though, it had been a great season, and I was very happy for him that he was getting to play against such high-caliber kids. 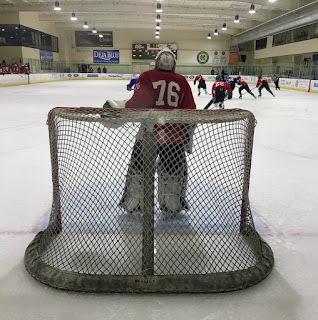 The camp format was that he would play one period of two different games on Friday, then have an hour-long goalie evaluation session where they did various drills. Then, cuts would be announced, and six goalies would be coming back for the weekend. See all those marks? those are puck marks from two periods of wear. That's how hard they shoot. I didn't know what to expect. Eli has played so well this year, and his technique is so precise. Outstanding rebound control, which is very tough for younger goalies to master. I was hoping that's what the judges would be looking for, but who could know for sure? I did know, though, that he would give it his all. Give'r, as they say in Canada.